Ice skating is one of the most beloved winter pastimes. It is also a favorite among couples looking for fun ways to enjoy each other’s company. During your getaway to Stanton House Inn, we highly recommend Rye Playland ice skating. As one of the top ice facilities in the nation, Playland Ice is a great place to spend a rainy day or enjoy quality time together this holiday season. For even more local attractions such as Rye Playland ice skating, take a look at our free Greenwich Vacation Guide! It’s a handy reference for all the best things to do during your getaway. Whether you come for an hour or for the full afternoon, ice skating at Playland is a total blast! Two rinks are open for your enjoyment during public skating hours, both of which are equipped with state-of-the-art music systems and dance lighting. 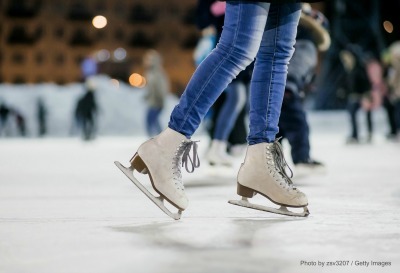 During the holiday season, extra public skating hours are added to ensure that everyone will enjoy the most from their ice skating experience. If you want to practice your figure skating skills, Playland Ice offers numerous freestyle sessions throughout the week. Sessions are between 45-60 minutes, giving you plenty of opportunities to sharpen your twirls and jumps. If you wish to learn how to figure skate, private lessons are also available to recreational and competitive skaters. If the excitement of whizzing across the ice with a hockey stick in hand is more your forte, we suggest giving the Rye Playland Ice Skating StickTime a try. All ages and experience levels are welcome to attend. It gives you and your team members a chance to work together and learn the fundamentals of the hockey game. Don’t forget to bring your own puck! If you wish to learn hockey in a more relaxed setting, private lessons are also offered for this sport. Even the most skilled ice skaters have more to learn! If you’re feeling up to the challenge, you may be interested in taking one of Playland’s Learn to Skate classes. This is a great way for couples and families to connect while learning something new. There are several classes for you to choose from based on your current experience level. After one of these quick lessons, you’ll be skating like a pro in no time! Interested in more ice skating options? Continue the fun at these nearby rinks! Hommocks Park Ice Rink: This popular ice skating facility has been a local family attraction since 1975! It also plays host to a variety of recreational events throughout the year, so be sure to check their calendar during your trip! Ebersole Ice Rink: Open from October to March, this rink is a fun and inviting place for the whole family to skate. The rink serves as the home for three hockey and skate teams, including the White Plains High School Tigers and the Archbishop Stepinac Crusaders. Our historic inn has been recognized as one of the best New England bed and breakfasts! Come and see for yourself why so many visitors fall in love with our romantic getaway destination. The charming accommodations boast lovely decor and comfortable amenities you’ll rarely find anywhere else. We also offer a wide array of special vacation packages to make your stay even more memorable. Book your stay with us today before we close for the season! Don’t forget to download our Greenwich Vacation Guide for an entire list of local recommendations.